"This is a pecan pie with a cheesecake layer." Unroll 1 pie crust on a work surface; brush with water. Place second pie crust atop the first pie crust; press gently together. Place the double crust in a 9-inch pie pan. Beat cream cheese, 1/2 cup sugar, 1 egg, vanilla, and salt together in a bowl until smooth and creamy. 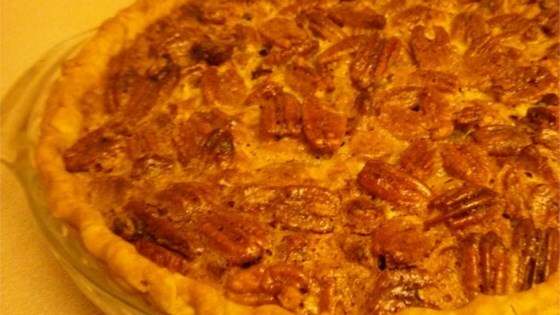 Pour into pie crust; sprinkle cheesecake filling with pecans. Mix corn syrup, butter, 1/4 cup sugar, 3 eggs, and rum extract together in a bowl until smooth; pour over pecan layer. Bake in the preheated oven until a knife inserted in the center of the pie comes out clean, 45 to 50 minutes. Absolutely delicious! Great recipe. Easy to make and came out perfectly! This pie/ cheesecake was absolutely delicious; it was easy to make too. I loved it the way it came out. My husband said he would increase the cheesecake part. Either way, it is a keeper!